Indie games frequently look at the past for inspiration. It’s why we have so many SNES-era two-dimensional platformers and Metroidvanias. 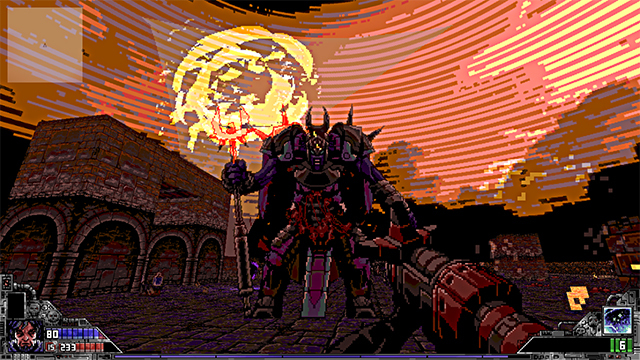 And for as much as Axiom Verge was like Metroid, PROJECT WARLOCK is like the original Doom. It’s aiming its double-barrelled shotgun squarely at first-person shooters from the mid-1990s where you’re never reloading and never not sprinting. Project Warlock embraces those influences to craft an arcadey, nostalgic throwback with satisfying gunplay that proves why those games were so inspirational in the first place. It even has a similar setup to those past titles. Worlds are chopped up into singular episodes that have clear starting and stopping points. The overly gruff badass protagonist then runs throughout these stages searching for keys while shooting demons, monsters, and whatever other hellish creation the game throws at you. Project Warlock is impressive in how it takes that blueprint and bends it for its needs when necessary. Keycard hunting is still the, well, key to progressing but it’s never as laborious as its spiritual predecessors. Keys (which are even cleverly tailored to the level’s theme) aren’t difficult to track down and the game is usually well designed enough to naturally funnel you back to where you need to go. It sounds small but this modernized improvement cuts down on the tedium of continuously backtracking and keeps the pace moving as fast as its protagonist. For as forgettable as he is, the protagonist’s movement speed is why the game’s shooting holds up so well, despite clinging to such an old formula. Sprinting is the new casual jaunt as the Warlock glides around the battlefield as crisply as Doomguy or BJ Blazkowicz did in the early ‘90s. Running as quickly in every direction gives firefights a frenetic tempo that pushes you forward at all times, even if it isn’t nearly as difficult (on normal) as its retro skin implies. 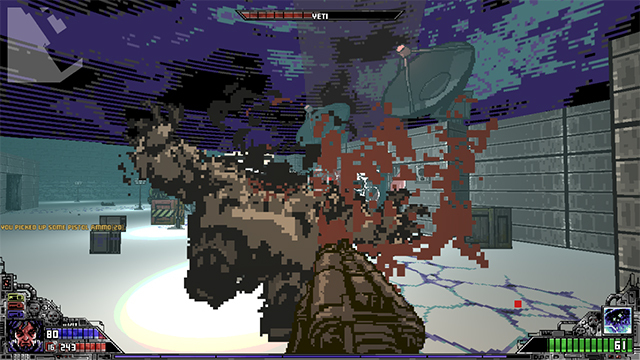 Fast movement speed allows the game to have defensive maneuvers, given how most enemies shoot avoidable projectiles. Games like this show the folly of modern undodgeable hitscan weapons and how it cripples almost any notion of defensive play. Battles become a ballet of weaving through the barrage of oncoming death orbs while chiding the melee enemies into a row so you can blast them into chunks with the shotgun. Then you can either switch to your long-ranged firearms to clean up the projectile throwers or just use your fast sprint and roll right up to them with your axe or trusty boomstick. The vast array of weaponry gives you this wealth of options and ticks all the necessary boxes from minigun to rocket launcher to a legally ambiguous BFG knockoff. Enemies grow in numbers and difficulty as your arsenal expands which always keeps you in line while also fulfilling the power fantasy this game is obviously trying to cultivate. Beefy audio design plays an essential part in sculpting these powerful guns, especially the two booming shotguns where each thunderous clap is capped off with the quiet yet satisfying sound of an empty shell clinking on the floor. The fantastic soundtrack is the fitting aural backdrop that punctuates the rippin’ and tearin’ with its mix of electronic, metal, and atmospheric melodies. The score works great by itself but appropriately fuels (and is fueled by) the on-screen carnage. From the audio design to the way enemies gib and crumple, everything about Project Warlock’s combat is designed to make you feel like an almighty god. It’s appropriate for the tone the game is trying to strike and all these pieces work together to help realize that goal. Sometimes this even works too well, given how all of the bosses (except one) are disappointing pushovers. Circle-strafing and shooting is a standard for that specific type of game so it’s understandable but not excusable. Project Warlock, as its title might imply, has some RPG systems that further push how strong you can be. There are two types of skill points: Upgrade Points you find and Unlock Points you earn from leveling up. The Unlock Points scattered about the levels can be dumped into your magic of weapons while the Upgrade Points gained from leveling up can boost your stats like health, ammo capacity, and so on. Boosting your character is pretty standard and a welcome option but upgrading weapons is more involving. Each weapon gives you two diametrically opposed options and choosing one locks out the other. Deciding whether or not to make your flamethrower’s spread wider or longer is a worthwhile choice, but picking between your guns and spells is not. Magic is never as useful as the military’s worth of weapons at your disposal so it’s foolish to dump your points into anything but your firearms. Weapons and spells should have had their own skill points to avoid having one atrophy in favor of the other more useful system. New Game Plus (with a better, harder difficulty level) would have softened this blow but, sadly, that is not an option and feels like an huge oversight. 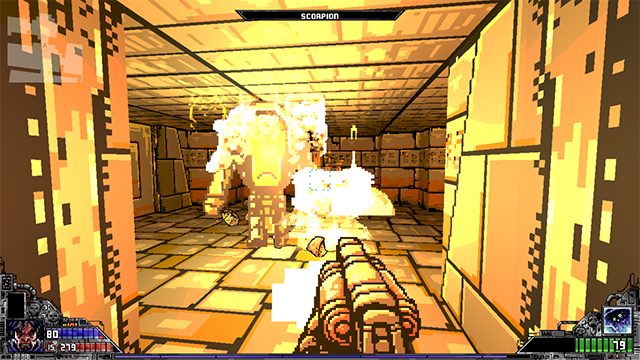 Although Project Warlock’s most apparent inspirations are Doom, Wolfenstein, and Duke Nukem 3D, it also contains homages to Serious Sam and classic films like The Thing and The Terminator. But it doesn’t come across as a mosaic of references that were cobbled together for the sake of cashing in on nostalgia with little else to offer. It is undoubtedly channeling nostalgia—you literally go to hell and fight Satan—and not breaking much new ground but it’s a testament to how well those shooters worked then and how well they can work now when properly updated (for the most part). Slavish devotion to archaic roots can often lead to games being doomed to repeat the past. But Project Warlock‘s speedy gunplay, rockin’ soundtrack, and armory of slick weapons combine in a way that make it a bit more than a repeat of past Dooms and results in a game that’s bigger than the sum of its many recognizable parts. Project Warlock was reviewed on PC via a digital code provided by the publisher. Plenty of weapons that are satisfying to fire. Avoids most old school design shortcomings. Simple RPG systems give the game a good sense of progression. Upgrade points power both spells and weapons. No New Game Plus or reasonable harder difficulty level.